Big win tonight for the Jeff Wrestling team as they traveled to Trinity to meet up with the #1 ranked team in KY. The meet started at 106 with Cameron Beasley winning by major decision, onto 113 Xavier Gatton winning by a major decision for his first victory of the season. Then Jeffersonville went on a roll of pins from 120-132lbs – Carlos Monroy, Jack Ferraro and Noah Morrison all picked up pins. 138 pounds was a close won – Carson somerville lost 15-11, but was down by ten points after the first period. “I was very proud of Carson. He was down but refused to give up, the second and third periods here were two of his best all season. I applaud his huge effort.” – Coach Struck. At 145 Josh Cooper picked up a major decision. 152 – Josiah Freeman won by fall over Brett Tully of Trinity. 160 lbs jeff lost to Hudson Heidorf, the #3 ranked kid in KY. Donovan showed a ton of fight and fell short by pin fall. 170lbs, Kameron Fuller won 8-4 over #11 ranked Andrew Pritchett. 182, 195, 220 and HWT all ended up with wins – Luke Smith, Darien Newbolt, Nathan Long, and Brennan Robinson. 285 was exciting as Brennan was down 1-0 going into the third period, and took the lead with just 20 seconds to go. I was very proud of the aggressiveness the kids showed tonight. Our goal was to attack first, which we did, and to push pressure for 6 minutes which we did. We showed improvement from the weekend, which we needed. The Jeffersonville red devil wrestlers have had a tough schedule. 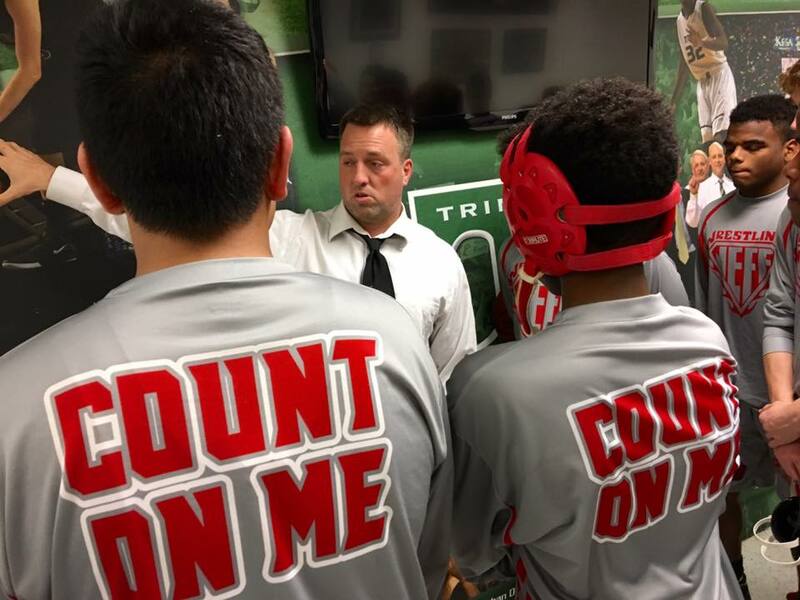 They have wrestled and beat the #1 Ranked team in KY – Trinity. As well as wrestled top Indiana teams – #1 Warren Central, #4 Perry Meridian, #11 Jennings County, and #20 Columbus East. This weekend they will travel to Evansville Mater Dei to take on the #2 ranked team in Indiana as well as Jasper, Bloomington South, Castle, and the returning KY state champions Fern Creek. JV Winners versus Trinity tonight were: Darian Collins, Marcus Vazquez, Vaughn Lloyd, Christian Carol, Josh Craig, Humberto Pulido, Dylan Post, Josh McCorkle, Daniel Watson.